Chernobyl, Ukraine, was the site of a major nuclear disaster in 1986. When a systems test in a reactor there went out of control, the ensuing meltdown sent radioactive material across Europe. The surrounding region in Ukraine was contaminated - and remains so until this day. At first the Soviet Union officials tried to cover up the disaster. The population was not informed or evacuated. The impact of the accident is felt until today with long-term health consequences and deaths. This page is a collection of DW Chernobyl-related content. 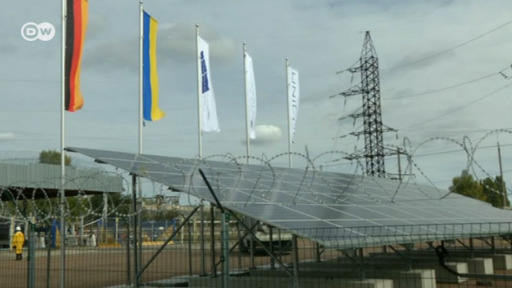 A new solar power plant has opened in Ukraine, a stone’s throw from where Europe’s biggest nuclear calamity took place three decades ago. In April 1986, a botched test ultimately led to thousands of deaths and clouds of nuclear fallout blowing across much of Europe. It’s been more than three decades since the Chernobyl Nuclear Power Plant exploded. Catastrophic radioactive contamination turned the 30-kilometer exclusion area into a “dead zone.” But left to its own devices, new life is evolving in the radioactive wasteland. France beefs up border security after militants highlight a new migrant route. Britain's royal events have church bells and cash registers ringing. The United States moves back into an air base it left more than a decade ago. The English town of Salisbury attempts to repair its reputation after the Skripal poisoning. When reactor 4 of the Chernobyl nuclear power station exploded 32 years ago no-one could have predicted the extent of the fallout. It remains the single biggest nuclear accident in history. A 30-kilometer exclusion zone around the power plant became somewhat of a barren, so-called dead zone. DW's Nicholas Connolly went to see how nature is adapting to this unique habitat left behind by mankind. A German-Ukrainian consortium is setting up a solar array in the exclusion zone around the site of one of the worst nuclear power plant disasters in history. Starting in February, it will deliver clean energy to the surrounding region.